Seventeen years ago next month, my late husband Fred and I moved from San Jose, California to the Oregon coast. I had never lived outside the Bay Area before. I was always within an hour’s drive of my family and all the landmarks of my youth–the schools and churches I attended, the newspapers I worked for, and the parks, beaches and theaters I had enjoyed all my life. My parents still occupied the same house they had bought in 1950. I had no idea what a shock it would be to move away from everything I knew. When Fred and I came to Oregon, we knew three people in the whole state: the real estate agent who had rented us our house and friends from San Jose who had moved to Bay City, up the road a couple hours from our new home. We also had no idea anyplace could have so much rain and wind. That first winter was brutal for California kids who were used to annual rainfall in the single digits, not Lincoln County’s 80 inches per year average. And the homesickness! I was a weepy mess and would have gone home to California except for two things: We couldn’t afford it, and Fred loved it here. Instead of moving back, we visited. A lot. That first year, we went back so many times our friends suspected we hadn’t really moved away. Gradually over the years, our visits have stretched out to two or three times a year. Now, with Fred gone, I go back to California alone. I’m guessing I’ve done the drive about 40 times. It’s a beautiful drive, whether I take the meandering coast route or zoom down I-5. Either way, it’s about 13 hours of driving, two days for me. I can tell you all the landmarks along the way, the good places to eat, the scenic attractions worth seeing, and the places where the driving gets hairy. I wrote a book about our move to Oregon and what followed. (Shoes Full of Sand—buy a copy please). Maybe someday I’ll write one about the road to California. Various reasons take me back home. Holidays (rain and snow), the annual Dia de Portugal (hot! ), funerals, and reunions. 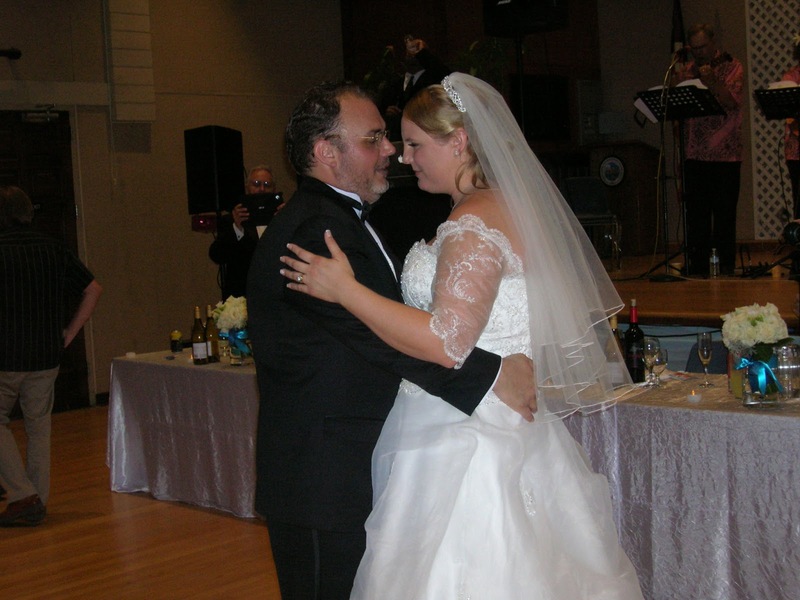 Most recently, it was my cousin Rob Avina’s wedding reception with the beautiful Candace Bates. It’s the best kind of occasion to drive down for because I get to see a maximum number of relatives at one time. 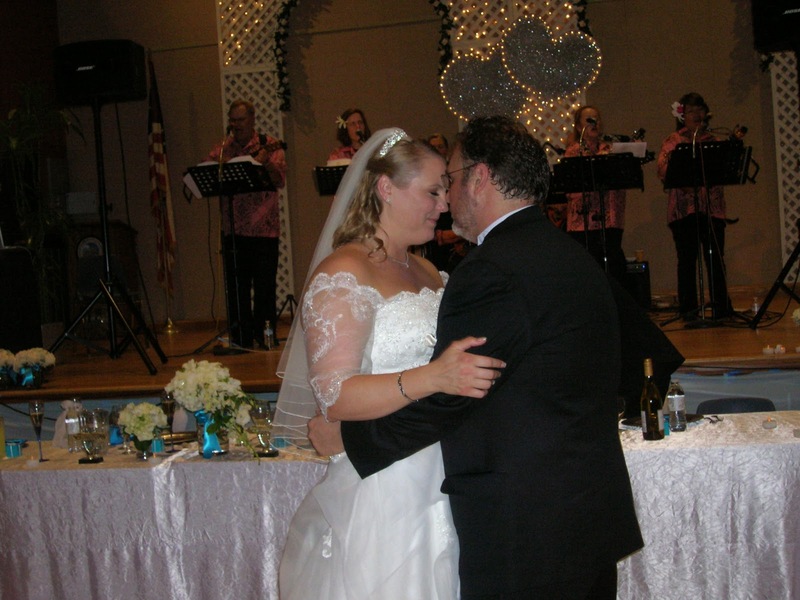 Rob and Candace got married on a cruise ship just before it left for Alaska. But their families threw a bang-up reception at the Santa Clara senior center, where several of them work or volunteer. Nachos in the courtyard, a banquet in the auditorium with a Hawaiian band AND a DJ, lots of toasts, lots of photos, lots of dancing, and lots and lots of hugs. And now I have a wonderful new cousin. I bunked at my childhood home, where my 91-year-old father and I talked nonstop for four days. And then it was back on the road again. I swear sometimes I think I live on the freeway or at a Best Western motel. I hated saying goodbye to my dad and everyone in California. It physically hurts every time. But when I cross the border back into Oregon, which is my adult home, where my work and my dog are waiting, and where I have acquired more friends than I can count, I shout and pump the horn. I’m back! Previous Previous post: OMG! They can see me!